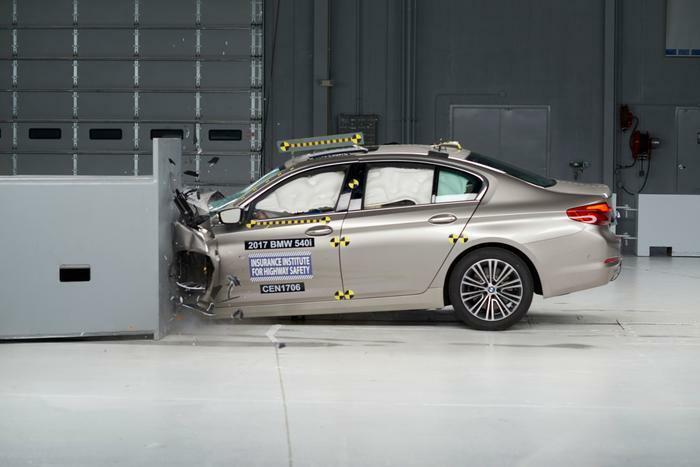 A revamped BMW 5 series offering good protection in a small overlap front crash helped the series capture the Insurance Institute for Highway Safety’s (IIHS) top award for safety. The previous generation of the large luxury car failed to hold up well during that test. Across-the-board good crashworthiness, an optional front crash prevention system with a superior rating, and available good-rated headlights made the difference for the 2017 5 series, qualifying it for the IIHS TOP SAFETY PICK+ award. In order to earn that award, a vehicle must have good ratings in the small overlap front, moderate overlap front, side, roof strength, and head restraint tests, as well as an available front crash prevention system with an advanced or superior rating and headlights that earn an acceptable or good rating. In the small overlap test of the 2017 model, the driver space was maintained well, with maximum intrusion of five inches at the footrest. The airbags and safety belt worked well together to control the dummy's movement, and measures taken from the dummy indicated a low risk of any significant injuries in a real-world crash of the same severity. In contrast, when the earlier model was tested, maximum intrusion reached 12 inches at the footrest, and the steering column was pushed back three inches toward the driver. Measures taken from the dummy indicated that injuries to the left lower leg would be likely in a real-world crash, with possible injuries to the left foot as well. The 2017 5 series has two different optional front crash prevention systems -- both earning a superior rating. In IIHS track tests, cars equipped with each system avoided collisions at 12 mph and 25 mph. The 5 series also has two different headlight systems available. Those that come with the optional lighting or premium package earn a good rating, while the standard ones are rated marginal.